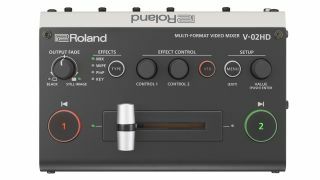 The What: Roland Pro AV has introduced the V-02HD Multi-Format Video Mixer, which combines a simple switcher, high-quality scaler, input expander, and inline video effects/composition and audio solution in one portable unit. The What Else: As a simple switcher, Roland’s V-02HD can provide a professional cross-dissolve switchover between sources while maintaining hi-res “pixel-accurate” display resolution with deep 10-bit 4:4:4 color space. It can also transform a two-camera shoot into a one-person production, providing reliable recording or livestreaming. The unit accepts the outputs from two HDMI cameras and enables seamless switching to a connected recorder or livestreaming encoder. Simple two-button operation means that even a first-time user can accomplish professional switching of multiple sources, and hands-free switching is possible using an optional footswitch. Not all HDMI-equipped devices are compatible, but the V-02HD matches them to the resolution of the receiving device and then resizes them to fit the associated display by offering both input and output scalers as well as HDCP/multi-format support. The V-02HD accepts SD, HD, and computer resolutions ranging from 1080/59.94p down to 640x480/60Hz VGA. Transition, composition, and visual effects tools may be applied in real time from the front panel controls. Fourteen visual effects and five composition effects are included, with adjustable parameters to fine-tune the results. Operators can use the onboard composition effects to add titles, apply the key effect for green screen work, or create a separate inset window with the PinP capability. In case of an input source problem or if content is not yet ready or able to be shared, the V-02HD can store a still image for immediate display. The V-02HD mixes two-channel audio from sources with HDMI de-embedding along with one stereo analog input for external sources via a 3.5mm jack. The unit supports analog and 24-bit/48kHz linear PCM digital audio with embedding to the HDMI outputs for recording or livestreaming, as well as analog output to a dedicated audio mixer or other device, or for headphone monitoring, through a second 3.5mm jack. Onboard audio processing includes three-band EQ, high-pass filter, compressor, noise gate, multi-band compressor, limiter, and delay, and there is a test tone output. A built-in effects library offers presets for managing common production scenarios such as interviews, ambient sound recording, and the elimination of wind noise when filming outdoors. These tools even work with inline HDMI signals, allowing audio issues to be addressed without leaving the digital domain. The Bottom Line: This ultra-compact “micro-switcher,” designed for solving challenges in livestreaming and video production workflows, fits into most equipment cases and camera bags making it easy to have on hand for every production and also conveniently attaches to standard video mounts and tripods.